Last week I was back in The Church and came away refreshed. 😉 Elly came to meet me and we walked round the area at the back of the building. It was at one time a very popular graveyard for the dearly departed members of St. Mary’s parish, a large and wealthy congregation. By the 1940s, the large churchyard was being used as a playground, with the tombstones being removed to the further end of the yard. It was de-consecrated in April 1966, the Church of Ireland sold the graveyard to Dublin Corporation which later developed the site now known as Wolfe Tone Memorial Park. Why Wolfe Tone? Theobald Wolf Tone – United Irishmen Founder was baptised in St Mary’s Church, in 1763. The park’s feeling of openness, perhaps because it is unfenced and accessible and allows for unimpeded shortcuts between the busier nearby streets, yet it maintains a separate identity from the paths on either side. An urban space with a variety if hard surfaces, which includes a large gravel area adorned with a cow. 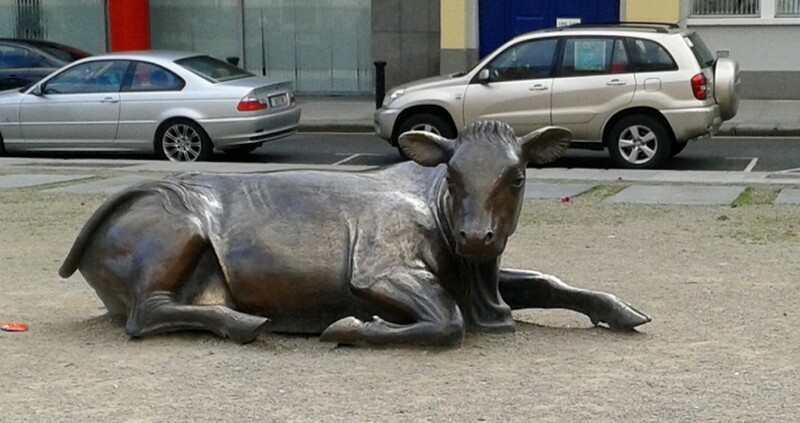 This entry was posted in Ireland, Photography, Sculpture and tagged City Cow, Jackie McKenna, Sculpture, The Church, The Confession Box, Wolfe Tone Memorial Park on May 20, 2014 by Grannymar.